The Burger Priest are looking for individuals who are looking to build and run a successful Burger Bar Franchise. 2018 sees The Burger Priest brand ready for expansion with an ambitious target of 10 stores over the next 18 months. Run your own profitable Burger Bar Franchise with The Burger Priest! 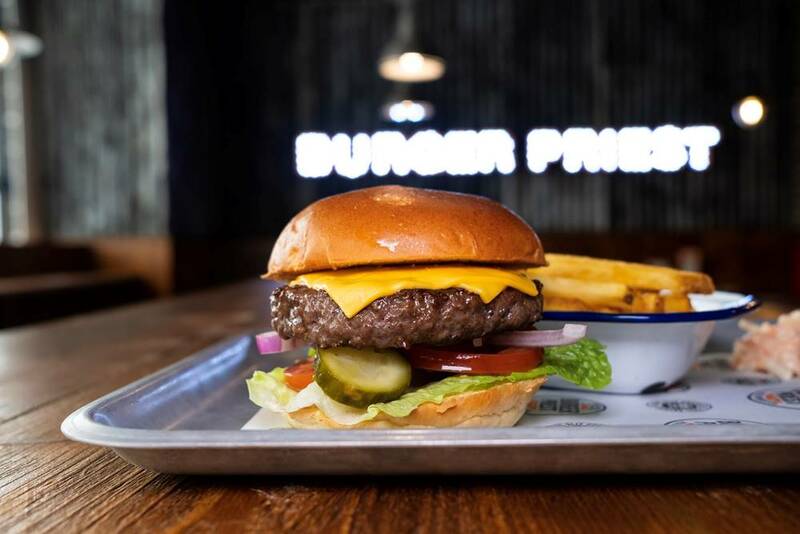 The Burger Priest are now introducing their quirky brand to the high street and shopping malls across the UK and Ireland. They are looking for individuals who are looking to build and run a successful Burger Bar Franchise. Directors, Tom Potts and Keith Fox devised the concept and bring with them over 35 years in the hospitality sector. Constant honing of the menu, supply chain, service standards and branding all contribute to the creation of stronger net profits and continuous growth in brand awareness. An ambitious target of 10 stores over the next 18 months will secure the position of the brand in a market that is in growth, while maintaining its niche feel and look. The ideal location for the Burger Priest Franchise includes traditional high street units and shopping centre food courts. The Burger Priest can be anything from 1200 sq. ft. to 4000 sq. ft.
Venue refurbishment costs are dependent on size, location and condition of agreed site, the fit out costs are the responsibly of the franchisee. Finance packages may be available subject to individual status and circumstances up-to £400,000. Find out more about The Burger Priest Business Opportunity and running your own Burger Bar Franchise. Click below now!